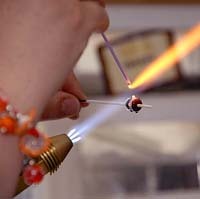 Cheryl Brown sports some of her own jewelry as she creates lampwork glass beads using a mid-range propane/oxygen torch. Above, Brown adds texture and design to a bead with small droplets of molten glass. Below, the glass beads must be fired in a small kiln before they are completely ready to be turned into a piece of jewelry. Cheryl Brown is a pyromaniac, but in a good way. A Grande Prairie artisan well known for her pottery, Brown has developed a talent for melting small rods of glass and turning them into tiny little works of art and jewelry. 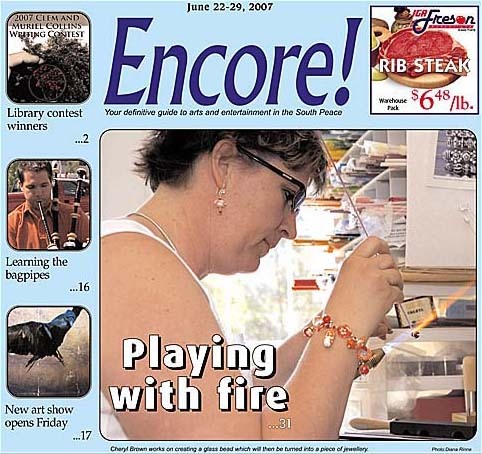 Known as lampworking, the art form captured Brown back in 1999 when she first took a course during Red Deer College’s summer series. “It happened by accident,” she explained. Pregnant at the time, Brown was supposed to take a welding course, but opted for something a little less toxic. A potter with a home studio, Brown put off the lampworking for a couple of years, telling herself she didn’t have time to pick up another hobby. “I put it on the back burner, and then I took another course and I was like “Okay I reeaalllly like doing this’,” she laughed. Brown realized she had the space and drive to take on another art form and has since been completely hooked on creating with glass. For Brown, it is the colour that really drew her to the craft of creating lampwork beads. “With the pottery you can get colour with glazes, but you can’t get that very vibrant colour. This (lampworking) kind of fed that desire to play,” she said. The concept of sculpting with the molten glass also appeals to Brown. Stainless steel mandrils, a metal rod around which the glass is shaped, are key to the process of creating the glass beads. Brown has a variety of sizes with which she works, though she noted she tends not to make any too large. Brown begins with a base bead, which is centred on the mandril by melting a stick of coloured glass over a mid-range propane/oxygen torch. She twirls the mandril in her fingers while the glass melts, creating a molten ball, which can be shaped as it cools. Once the base bead is centred, Brown can start adding colours, and texture to the piece bit by bit. Adding small blobs of molten glass and then pinching them into petals as they cool creates a flower. Once she is satisfied with the beads, they go directly from the flame into a small 960 F kiln for at least 30 minutes, depending on the size and shape of the bead or sculpture. “You have to actually keep it all fairly close to the same temperature, because if you don’t then it will snap on you,” she explained. The glass itself comes in any colour you could imagine. Brown uses Effetre Moretti glass rods, which are made in Italy, as well as the German Lauscha glass. Brown said she has started getting some of her glass from the U.S., as it is more consistent in colour. Brown has a lot of fun with her jewelry and tiny glass sculptures. She’s created everything from necklaces and earrings (“Who doesn’t like bling?” she said), to tiny purses, to a funky series of teapots used to hold essential oils or perfumes. “Those are fun to make, but you have to hope that it doesn’t all blow apart right at the end because keeping it all hot when you have that much glass and only this much flame is a challenge,” she said. It’s that challenge the artist enjoys however. “I like pushing it,” she admitted. 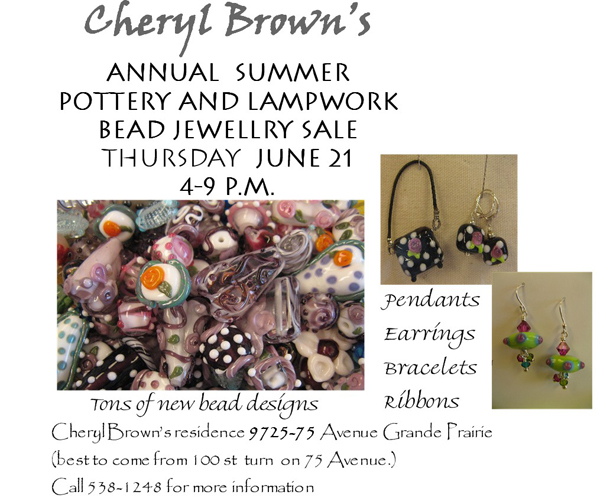 SALE: June 21 at 4-9 P.M.! See the attached flyer!